In the span of 10 comfortable nights, and in the company of PBS’ most admired performers and producers, 490 luxury travelers will explore charming cities from Newport and Bar Harbor to Halifax and St. George on an all-inclusive luxury voyage aboard Seven Seas Navigator®. ​In addition to our all-inclusive amenities, Iconic Lighthouses & Pink Sands also features FREE Roundtrip Air* and up to 36 FREE Shore Excursions. ​This always popular Spotlight features fascinating programming as some of PBS' most admired performers and producers come aboard to create learning experiences in the areas of politics, current events, history, culture, finance, health and wellness and more. Explore rich history, witness UNESCO World Heritage Sites and meet fascinating filmmakers – those with their fingers on the pulse of politics, history, current events, finance, and the arts. As part of our Spotlight on Public Broadcasting programming, delight in a special shore excursion celebrating the Tony Award-winning musical Hamilton and a visit to the public broadcasting studios of Boston’s WGBH station for a chance to meet producers and personalities from American Experience, American Masters, FRONTLINE and more. Presentations and panel discussions with notable public broadcasting personalities are open to all guests on board. There is no additional cost associated with this Spotlight program. *Fares subject to increase April 1, 2018. All fares and offers are per person in U.S. dollars, valid for residents of U.S. and Canada, based on double occupancy for new bookings only and may be changed or withdrawn at any time. Not all promotions are combinable. 2-for-1 Fares and Early Booking Savings or Bonus Savings are based on published Full Brochure Fares; such fares may not have resulted in actual sales in all suite categories and do not include optional charges as detailed in the Guest Ticket Contract. Early Booking Savings and Bonus Savings amounts featured are per suite and are reflected in the fare. 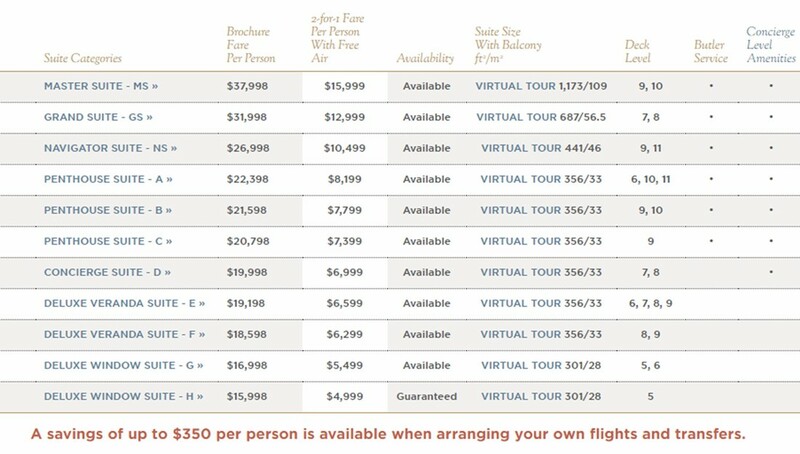 Air Credits featured are per person and reflect Business Class Air on Intercontinental flights and Economy Air on Domestic flights. Single Supplement savings are capacity-controlled and are available on select voyages and categories. FREE Roundtrip Air includes ground transfers between airport and ship and applies to coach, roundtrip flights only from the following airports: ATL, BOS, CLT, DEN, DFW, DTW, EWR, FLL, IAD, IAH, JFK, LAX, LGA, MCO, MDW, MIA, MSP, ORD, PBI, PHL, PHX, SAN, SAV, SEA, SFO, TPA, YUL, YVR, YYZ. Airfare is available from select other U.S. and Canadian gateways for an additional charge. Airline fees, surcharges and government taxes are included, however, airline-imposed personal charges such as baggage fees may apply. FREE Business Class Air applies to intercontinental flights only. Custom Air arrangements may be made 270 days prior to sailing (custom air fees apply). Regent Seven Seas Cruises voyages calling on Cuba fully comply with the existing U.S. Federal Regulations and the most recent pronouncements from the Office of Foreign Assets Control (“OFAC”) of the U.S. Department of the Treasury. Please see our website for additional visa and documentation requirements. Guests who elect not to participate in Regent Seven Seas Cruises® standard Air/Sea Program or do not purchase transfer arrangements from Regent Seven Seas Cruises® will be responsible for their own transfer arrangements to and from the ship. FREE Unlimited Shore Excursion reservations are on a first-come, first-served basis and are subject to availability. All children 17 and under are required to have an adult 18 years or older with them on any of our excursions. Shore Excursions early bookings close 7 days prior to sailing. A 75-minute window is required between tours operating on the same day in port. FREE First Class Air applies to all domestic (U.S.) ports for guests sailing in the Regent Suite on Seven Seas Explorer® and is a part of our Grand Voyage & World Cruise amenities, see below for details. FREE Business Class Air applies to Intercontinental flights only and any pricing for Business Class Air upgrades are listed per person, each way. FREE Roundtrip Business Class Air in all suite categories will be offered on all Intercontinental flights. 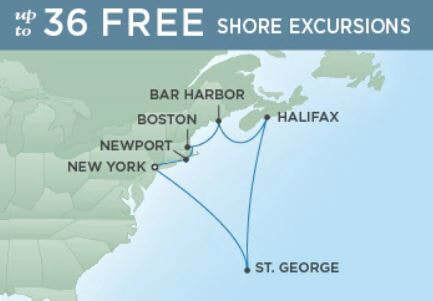 FREE Unlimited Shore Excursion reservations are on a first-come, first served basis and are subject to availability. FREE 1-Night Pre-Cruise Hotel Package applies to Guests 1 and 2 in Concierge Suites and higher and includes transfers from hotel to pier only. Hotel Package is capacity-controlled with limited availability and is not available for new bookings made within 60 days of departure. Regent Seven Seas Cruises® reserves the right to change or withdraw any Hotel Package at any time without notice. FREE Land Program applies to guests 1 and 2 for one Pre- or Post-Cruise program is not combinable with the FREE 1-Night Pre-Cruise Hotel Package or the 5% discount on Pre- or Post-Cruise Hotel or Land Programs available to guests sailing in Concierge Suites and higher. Guests in Concierge Suites and higher who choose a FREE Land Program or choose to arrange their own pre- cruise hotel accommodations will receive a credit in lieu of the FREE 1-Night Hotel Package, credit varies by voyage. Regent Seven Seas Cruises reserves the right to change or withdraw any Hotel Package or Land Program at any time without notice.